SignalR - it was just faster to setup everything with just 2 lines of code. Of course, it can be done with basic TcpClient and I will remove the dependency soon. ReactiveUI - the Reloader doesn't use it, there is no dependency on it. But I do use it on my Xamarin Forms projects, so I needed to make sure the xaml update plays well with it, mainly making sure that WhenActivated (Page.Appearing) gets called after update. I'm not sure if there is another use case for the live reload, that I'm not seeing. My use case is during the UI design development, making changes in the xaml file and seeing those changes reflected in the running apps without rebuilding and rerunning them again and losing a lot of time. From that point of view, it doesn't matter if the change is in memory or in the device - I just need to see the impact of the updates and when the next build is done they are included in the package. Do you have another use case in mind? Just pushed new version of HotReload. 2) You needn't update every xaml.cs file anymore! This is fantastic work Andrei! I love it. A few ideas to improve if possible. When switching platforms, I have to keep changing the ip address on the toolbar. Is it possible to eliminate this altogether? Could the device somehow report back its ip address at runtime? Or, at least, could the tool store the 3 ip address for the 3 target devices and select automatically based on which platform I'm debugging on? what it means? you can edit xaml.cs during debugging and it will reload changes. when i edit xaml.cs files in vs2017, it breaks my debugging usual, how did you overcome this? Awesome work ! Working with Prism & Syncfusion components in one shot. Well done ! @hauphidao have you read Readme yet? Set up all things correctly? If android emulator -- checked workaround section? @hauphidao and what platform do you test? * The Xamarin Forms XAML Previewer in Visual Studio uses System.Activator.CreateInstance. * This imposes a limitation in which the App class must have a default constructor. * App(IPlatformInitializer initializer = null) cannot be handled by the Activator. It does not work at all, or the app launch but your changes does not display ? I think that just might be that you put the wrong IP. @Umar3x how to set right Ip? 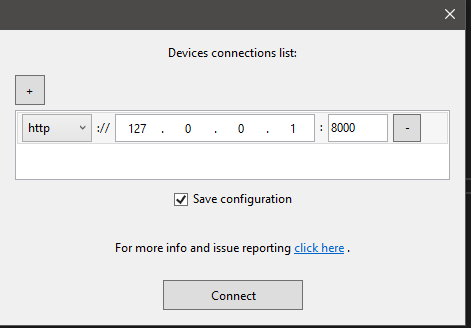 i set ip 127.0.0.1:8000, need set ip on device ? You'll see an ip, connec to this one in HotReload. @AndreiMisiukevich_ extension works for me on windows but i tried now using on mac with ios simulator, i am not getting it running. i enabled from tools menu. 127.0.0.1:8000 is the default ip and port. what could it be the problem? @AndreiMisiukevich_ it works fine for me on my mac also now. generally works great but sometimes, it stops and until i restart the visual studio it will not display the changes. did you experience this on mac? @batmaci hmm.. maybe there are some issues..
2. I am using emulator so tried with default 127.0.0.1:8000 but I did not see my xaml being updated as I changed it. 3. I've set the port to another value in Init constructor and also used the adb forward. It worked for a little while, even if it threw some errors but I managed to get some preview, now it fails again to work. I press Connect and the icon turns green, no error shown. Interesting that on output I can see that HOTRELOAD STARTED and I see the emulator IP addresses, but they are different from localhost. What am I doing wrong? Any advices? > 2. I am using emulator so tried with default 127.0.0.1:8000 but I did not see my xaml being updated as I changed it. > 3. I've set the port to another value in Init constructor and also used the adb forward. > It worked for a little while, even if it threw some errors but I managed to get some preview, now it fails again to work. I press Connect and the icon turns green, no error shown. 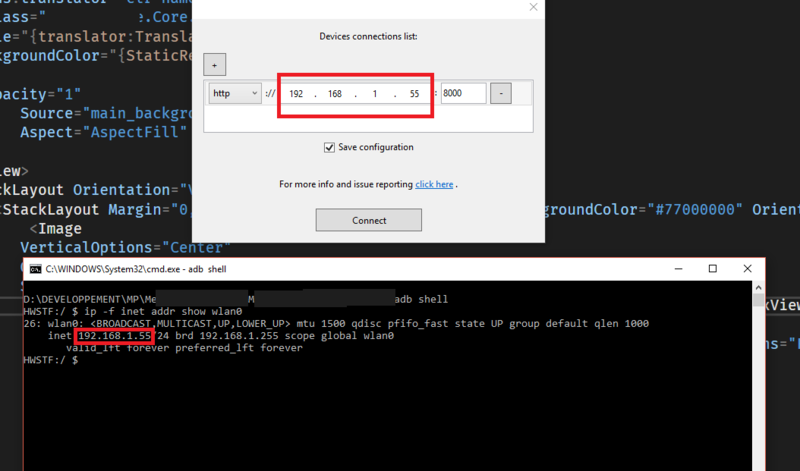 > Interesting that on output I can see that HOTRELOAD STARTED and I see the emulator IP addresses, but they are different from localhost. > What am I doing wrong? Any advices? Hi, could you please create issue on GitHub with all necessary information?